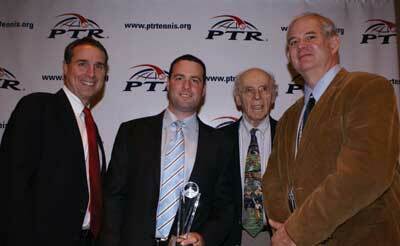 Hilton Head Island, SC — Professional Tennis Registry (PTR) presented its annual awards this week during the 2010 PTR International Tennis Symposium. The event, which includes 50-plus on court and classroom presentations for tennis teachers and coaches, a tennis trade show and $25,000 Championships is being held February 12-18, 2010, at PTR Headquarters on Hilton Head Island, South Carolina. Dr. Mark Kovacs, of Boca Raton, Florida, has been honored with PTR’s Stanley Plagenhoef Award. Named for Dr. Stanley Plagenhoef, the award is presented to someone who has excelled and made significant contributions to sports science. It was last presented in 2004 to Dr. Jack Groppel, so it is indeed a rare treat to recognize a worthy recipient. As a junior tennis player, Kovacs was ranked by the ITF as one of the top 100 players in the world. His junior career highlights include a win over Lleyton Hewitt at the 1996 Australian National Championships and a boys’ doubles pairing with Andy Roddick at the 1998 Junior US Open. In his collegiate career, Kovacs played for Auburn University, winning the NCAA doubles championship as well as All-American honors in 2002. Mark earned a Master’s degree in Exercise Science at Auburn, and a Doctorate from the University of Alabama. The primary focus of his work was tennis-specific research. He has published in several prestigious journals including Sports Medicine, the International Journal of Sport Physiological Performance, the British Journal of Sports Medicine, and Strength and Conditioning Journal. He has also written articles for TennisPro, PTR’s official magazine for tennis teachers and coaches. Dr. Kovacs co-authored the book Tennis Training: Enhancing On-Court Performance with Britt Chandler and Dr. Jeff Chandler. In 2009, Mark served as the Guest Editor for the Tennis Specific Edition of Strength and Conditioning Journal. Additionally, Kovacs is a Certified Strength and Conditioning Specialist through the NSCA, a Certified Health/Fitness Instructor through the ACSM, and a USTF Level II sprints coach. In January, 2008, Kovacs joined the USTA Player Development staff to oversee the Sport Science and Strength & Conditioning departments as Manager of Sport Science. USTA Player Development is charged with providing American junior, collegiate and young professional players with the opportunities to reach their maximum potential. Prior to joining the USTA, he was an Assistant Professor of Exercise Science at Jacksonville State University, in Alabama. Dr. Kovacs was presented the 2008 Strength and Conditioning Journal Editorial Excellence Award. His willingness to share knowledge with PTR members has been an asset to our organization.